woodshedding, or in a conservatory. You have to be born with them or learn them by living. 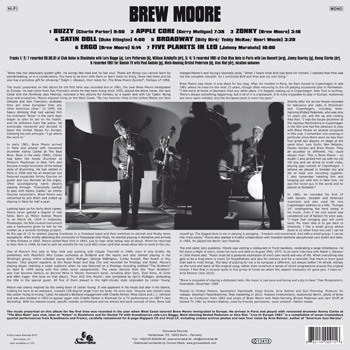 The music presented on this album for the first time was recorded live in 1961, the year Brew Moore immigrated to Europe. He had come from San Francisco where he had been living since 1955, played the Black Hawk, the Jazz Cellar and the Monterey Jazz Festival, recorded a few albums for Fantasy as a leader and with Cal Tjader. 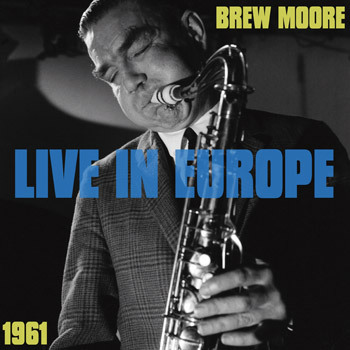 In early 1961, Brew Moore arrived in Paris and played with renowned drummer Kenny Clarke at The Blue Note. Back in the early 1940s, Clarke had been the house drummer at Minton’s Playhouse in New York and became a major innovator of the bebop style of drumming. He had settled in Paris in 1956 and his all American trio featured expatriate Jimmy Gourley on guitar and Lou Bennett at the organ, often accompanying name players passing through. “Everybody wanted to play with Kenny Clarke,” as Jimmy Gourley remembers. Brew Moore was welcomed to join them and ended up staying in Paris for half a year. Looking back on his fairly short career, Moore never gained a degree of real fame. Born as Milton Aubrey Moore Jr. on March 26, 1924 in Indianola, Mississippi, his first musical instrument was a harmonica given to him by his mother as a seventh birthday present. At the age of 12 he started playing trombone in a Dixieland band and then switched to clarinet and finally tenor saxophone. After briefly attending the University of Mississippi (Ole Miss), he started playing in Memphis and arrived in New Orleans in 1942. Moore visited New York in 1943, just to hear what bebop was all about. When he returned to New York in 1948, he had to wait six months for his Local 802 Union card that would allow him to work in the city. One of Moore’s first jobs in New York was working with Claude Thornhill in 1949, even if only briefly. He performed with Machito’s Afro Cuban orchestra at Birdland and the Apollo and also started playing in Kai Winding’s group, which included young Gerry Mulligan, George Wallington, Curley Russell, Max Roach or Roy Haynes. They played regularly at the Royal Roost and Bop City and recorded for Prestige and Roost. Moore’s playing began reaching a wider audience when he was featured on a Prestige recording entitled “The Brothers” on April 8, 1949 along with five other tenor saxophonists. The name derived from the “Four Brothers” who had become famous as Second Herd in Woody Herman’s band, including Stan Getz, Zoot Sims, Al Cohn and Allen Eager. 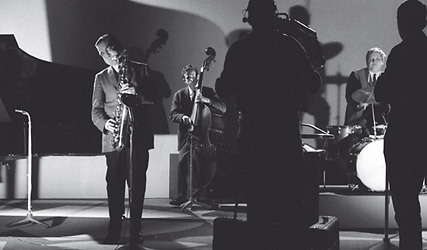 One tune on that album, “Four And One Moore”, was composed by Gerry Mulligan, dedicating the title to the special guest. All five of them played in the light-vibrato style originated by Lester Young. In 1962, he recorded his first LP with Danish, Swedish and American musicians and used his new Copenhagen address as a title, “Svinget 14”, emphasizing the hard swing in his music. Even if his cool sound was considered out of fashion he once said, “I hope that swinging jazz will come back! My main idea is to get back to simplicity. I like a small group where there is no other front line and I can let myself go. The biggest kick to me in playing is swinging - freedom and movement. And with a small group, I can do this more easily.” Moore also started a fruitful collaboration with Swedish baritone saxophonist Lars Gullin and later, in 1965, he played the Berlin Jazz Festival. used by friendly permission of University Library of Southern Denmark, cover artwork: Patrick Haase.